Appendicitis Misdiagnosis | Simmons and Fletcher, P.C. Failure to diagnose appendicitis in a patient is one of the most common reasons medical malpractice claims are brought against emergency room doctors. A ruptured appendix is not only very painful but it also spreads infection throughout your abdomen. If you went in complaining of pain in your right lower abdomen and the doctor sent you home only to have your appendix rupture due to the doctor’s failure to diagnose appendicitis, call Simmons and Fletcher, P.C. for a free case evaluation. You may be entitled to financial compensation for the injuries you sustained. Call 1-800-298-0111 for a free consultation today. Timely diagnosis of appendicitis is critical to ensure that a patient get the proper medical care. A painful appendix rupture can often be prevented if the appendicitis is caught early. In some cases, if the appendix is not too inflamed, appendicitis may be treated with antibiotics. However, in most cases, the appropriate treatment is to have it removed. Appendix removal or “appendectomy” is a routine surgical procedure. The National Institutes of Health published an article that states there are approximately 280,000 appendectomies every year in the United States. In most cases, individuals who undergo an appendectomy recover quickly and without complications. However, if appendicitis is not timely identified and diagnosed, the appendicitis will worsen and eventually lead to appendix rupture. 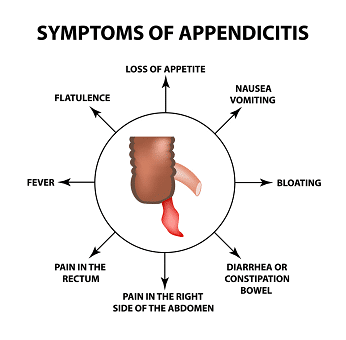 Appendicitis is a medical condition describing the inflammation of the inner lining of the appendix. According to the National Institute of Diabetes and Digestive and Kidney Disease, appendicitis is the most common cause of acute abdominal pain requiring surgery. Because the appendix does not serve a critical function in the body, when it becomes inflamed it may need to be surgically removed to prevent appendix rupture from occurring. Appendicitis is most commonly identified through abdominal pain on the lower right side of your body and is most easily diagnosed in males over 18. Many of the symptoms above are nonspecific. That means that, taken alone, several of the symptoms of appendicitis can be indicative of other medical issues as well. Because the symptoms of appendicitis may sometimes mimic symptoms associated with other medical conditions, inexperienced or inattentive doctors may not ask the right questions and/or perform the right tests to find it. They might jump to the wrong conclusion with performing a proper differential diagnosis. However, a complete medical history should trigger the doctor to consider the option and run the necessary medical tests. In order to prove that your doctor negligently misdiagnosed appendicitis or failed to diagnosis appendicitis timely, you must prove that the doctor, upon hearing your complaints, failed to ask further questions and/or run further tests that would have revealed that you were suffering from appendicitis. Instead, they misdiagnosed the complaints and sent you how with the wrong diagnosis and/or medication. Additionally, the law requires you to prove that, had the doctor properly diagnosed and treated you, you would not have suffered the same harm or to the same degree as you did in fact suffer. In Appendix rupture cases, the rupture can be prevented or avoided by a correct diagnosis and either treating the condition or removing the appendix. If you or someone you love has suffered injuries as a result of an appendicitis misdiagnosis, consult Simmons and Fletcher, P.C., immediately. We offer free case evaluations for medical malpractice claims because we understand how difficult recovering from medical negligence can be. Call us at 800-298-0111 to learn more about your rights.